If you track new mls listings in Tallahassee like I do each day, you rarely see a significant trend developing. At different times of the year, you expect to see more or less homes coming onto the market, like right now is typically when we see the number of sellers listing their homes begin to decline. But lately, I have been amazed at a trend that began a few weeks ago that defies our previous expectations. I keep a daily eye on new listings in the Tallahassee MLS each day that are priced above $100K. On measurement that I specifically monitor is the percentage of distressed properties that are coming into the market. As you might imagine, home sellers with equity do not enjoy competing with short sales, foreclosures, and bank owned properties, as these homes are often deeply discounted to get a quick sale. So I track short term trends in order to find changes in market behavior, and I think you might just see some change occurring in our first real estate graph of new MLS listings in Tallahassee. In the graph above, the vertical green lines shows the 30 day average price (measured on the left vertical axis), while the brown line measures the percentage of the new listings that are being marketed as distressed properties for sale. Using a thirty day average (the average measurement over the past thirty days) allows us to spot trends quickly, but often times the trends are due to seasonality. But take a look at the brown line nearly dropping off the graph lately. 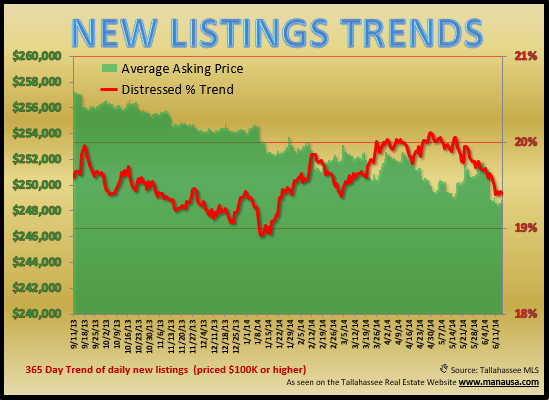 That means there are almost no distressed properties being listed in the Tallahassee real estate market right now! Good news for home sellers. When we take a look at the one-year average (the average measurement over the past three hundred and sixty five days), we find a different story, and seasonality appears to be the culprit. In this graph, the red line measures the one-year trend of the measurement of distressed properties as a percentage of the overall market. 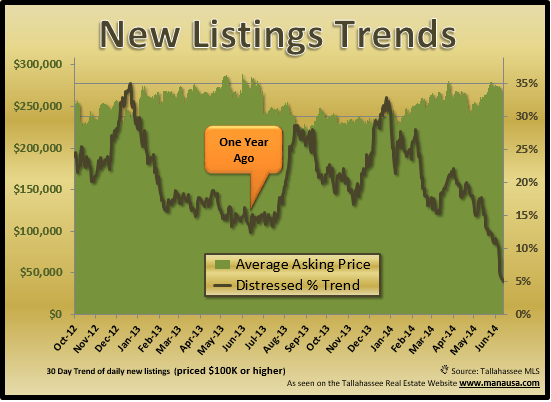 Since September of last year, it has hardly changed, bouncing around between 19% and 20% of all listings being distressed. But look at what has been happening with the average asking price. The green bars show the average asking price of homes over $100K has dropped from $257,000 down to $248,000, which is a 3.5% decline in just 9 months. While it is too early to say what this means for home sellers, it certainly is not good news. The following properties were recently listed for sale in Tallahassee. I hope you have a better feel for what is happening in the Tallahassee real estate market. If you would like to know more about new MLS listings in Tallahassee, just drop me a note and we can help you explore the best deals in town.